Recently announced the winners of its 2013 Travelers' Choice™ Awards for Destinations on the Rise. Kailua Village Business Improvement District was honored to learn that Historic Kailua Village was the top choice for visitors in the United States. BRAND NEW KING MATTRESS. The Most Comfortable bed I have ever slept on. I Don't Wakeup with a Back ache like I do on ALL other beds. !!!!! NEWLY BUILT LANAIS AND NEW SHADE AWNING !! NEW LANAI FURNITURE!!! *********ASK ABOUT CAR RENTAL DISCOUNTS !!!!!!!! SAM CHOY RESTAURANT IS NOW OPEN a Block from the condo. THIS CONDO HAS UNDERSTATED ELEGANCE!!! E-KOMO-MAI (Welcome) TO PARADISE! YOU HAVE FOUND IT!!!! AS YOU ENTER, You Won't be able to tell where the inside stops and the Outside Begins. Your First Reaction is 'WOW'! Your dilemma becomes, forget the Lu'au I think I'll spend my whole vacation right here! From EVERY DETAIL of the Tropical Decor, to the BREATHTAKING Full on OCEAN VIEW the moment you enter. IT IS ABOUT PEOPLE'S HOPES & DREAMS COMING TRUE FOR THERE VACATION OF A LIFETIME. RENT OUR CONDO AND YOUR DREAMS WILL COME TRUE. LOCATED A FEW MINUTES FROM KONA! Close to the All New Sheraton BUT WHY PAY THEIR HIGH RATES??? WE HAVE THE PERFECT PLACE TO SATISFY YOUR EVERY DESIRE AS OUR CONDO TRULY IS PARADISE! YOU WON'T FIND ANY BETTER SUNSETS THAN FROM YOUR LANAI AT OUR CONDO LOOKING OUT OVER THE OCEAN! This Elegantly Appointed, Tastefully, Newly Remodeled in Tropical Elegance with You in mind is a One-bedroom, One-bath 2 LEVEL TOWNHOUSE WITH AN OCEANVIEW from Both Lanais, One upper and One lower off of the Bedroom sleeps four in comfort. There is a UNIQUE ATRIUM in the bedroom. There is a NEW King Size Bed in the Bedroom and a Queen Size Sofa Bed in the Living Room. The spacious rooms with vaulted ceilings, mirrored closet doors, ceiling fans, and fully-stocked kitchen make this condominium unit seem much larger than its actual size. You will notice the attention to every detail! Enjoy a morning latte' while Watching the Whales frolicking (during whale season) and in the evening, Enjoy the magnificent sunsets and views from each of its TWO LARGE LANAIS (1 upstairs off living/dining room & 1 downstairs off bedroom) which brings the beauty of Hawaii's scenery indoors while providing privacy at the same time. Just open the oversized Upper lanai doors and windows and 'THE GENTLE BREEZES WILL CAPTURE YOUR HEART & IMAGINATION'. A BEAUTIFUL FLOWER GARDEN surrounds the pool area below the TWO LARGE LANAIS! There are too many Gorgeous Tropical flowers to list so you will have to come and see them for yourself. Relax by the pool with a good book sitting at one of the shade covered tables or soak up the sun while lying on a chaise. GOLF AT THE KONA COUNTRY CLUB is only a few steps from your door. SHOPPING at Keauhou Shopping Center is conveniently close by, and the resort is centrally located. Sunsets from the condo with palm trees in the foreground Snorkeling is very popular at Kahalu'u beach is a 3 min drive from the condo. Our favorite place to visit is the national park, Place of Refuge (or Pu'uhonua o Honaunau in Hawaiian). It is a historical site with 500 year old stone walls, petroglyphs, re-constructed temples and Hawaiian houses and some of the best tide pools, turtle sunning areas and a great beach for scuba, snorkeling, swimming and people-watching. It is worth the admission and the free parking. We go to the picnic area that faces the ocean to the south of the park---same route into area ---and watch the dolphins frolic right near the beach eating lunch at one of the many picnic tables available. This is about a 22 mile or a 45 min drive from the condo. For one of the top 10 beaches in the world , drive 45 min to Hapuna Beach. There is a HUGE perfect pale sand beach over a mile wide. The waves are perfect for boogie-boarding, body-surfing and swimming. There is a snack shop, showers, bathrooms and changing rooms. There is a fantastic beach trail going north where you will see whales in the distance all Winter long (take binoculars). The best shave ice (snow cones on steroids) on the whole island (maybe the whole state) is 4-5 miles north of Hapuna and is fantastic for after-beach cooling off before dinner. It is right near the little town of Kawaihae. We love to kayak at Captain Cook Bay (aka Kealakekua) and the snorkeling is so good a lot of the all-day cruises come to this bay for snorkeling, scuba, swimming and sea life watching (turtles, dolphins, birds). Going to the east side of the island is another world; MUCH more rain and the tropical vegetation is thick and beautiful. There are waterfalls, world renowned botanical gardens and fantastic state parks. On the southeast side of the island is Volcanoes National Park that has incredible attractions like hiking through a former volcano crater, exploring caves and lava tubes, a fantastic hands on museum about the islands and their formation, hikes along the lava at the ocean's rim where you may be able to find some flowing lava depending on the way the volcano is erupting (remember--it is 2000 degrees--you don't want to get too close). Park service does try to keep people away from the lava---you won't accidentally stumble into it! You were right - your condo is gorgeous! You have really created an amazing oasis here. Everything is clean, comfortable, and really well thought out. We absolutely love it! It's so peaceful & quiet here ... exactly what we were looking for. We walked down to the Sheraton last night, sat on the rocks & watched the waves & sunset. Absolutely stunning. So great that we can walk up to the market too. We had an awesome time here and our Condo was great! We would pick it again..! We just returned to Austin! NUMBER OF PEOPLE OCCUPYING UNIT MUST BE DISCLOSED AT TIME OF BOOKING, IF NOT, ADDITIONAL $50/PP CHARGES WILL BE ADDED TO CREDIT CARD ON FILE. A Credit Card Deposit is required with written or verbal confirmed booking. Pay Balance is due 30 days prior to arrival for Low season, 60 days prior for High Season. Directions and Key instructions will be sent Prior to arrival and once full payment is received. $250 Refundable Damage Deposit. IN US FUNDS! Cancellation Policy:45 days prior to reservation date a full refund less Non-Refundable Original 20% Deposit. Within 45 days is subject to rebooking. *NO REFUND once ALL Monies are Paid. NO REFUND For NO SHOWS Condo May be Substituted due to circumstances beyond our control. You Will Love Our Condo as We do. YOU WON'T WANT TO MISS THE OPPORTUNITY TO STAY AND EXPERIENCE THIS CONDO - THERE IS NOT ANOTHER LIKE IT SO METICULOUSLY DECORATED WITH YOU IN MIND. Far enough away from kona to be tranquil, but central to everything on the western half of the island. Beautiful view. Strict rules and appliances need an update, no A/C but well ventilated. Thank you for your Review. We have a Full Kitchen Remodel Scheduled in about a month of August 2017. Watch for New Photos of it. Be one of the first to experience the New Kitchen by booking it Now. The resort itself is totally awesome!!!! Would stay at this resort again in a heart beat! The condo is a little lacking in updating. Overall the condo wasn't very clean. Hard to keep island guests out when screens don't close properly. Actually were welcomed by one of the island guest:-( Shower small and curtain not clean. Lots of amenities in the kitchen. Washed several dishes before using - once done....everything was fine. The resort was incredible. Didn't spend that much time in the condo - lots of adventures to enjoy and the condo was on the dark side. This Condo is rented 90% of the time and I do not believe the issues as detailed. I have bookings as far out as 2019 from Annual Returning Guests every year for 6 weeks. 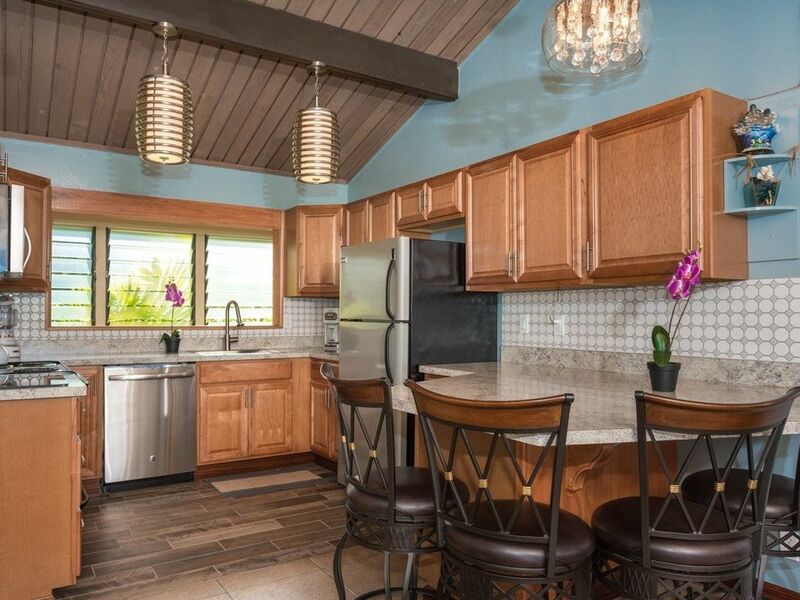 We own this condo and it is in great shape and one of the nicest units at Keauhou Resort. Her review is Very Unfair and Inaccurate. Rent it and you can be the judge. Let me start this review by saying that I started my search for lodging much later than I should have. My wife and I had never visited Hawaii during the holiday's. Luckily for us, Gayle's condo was still available. Having stayed in Keauhou during our previous trips, we prefer this location, which adds to excitement of visiting Kona in the evening, and reaching out to all the destinations during the day. The condo was very comfortable and well setup. The teenage boys immediately took over the upstairs, where there is a fabulous 60" TV, and of course is closer to the refrigerator. My wife and I claimed the downstairs, which has one of the most comfortable beds I have ever slept in. There is no AC in the unit, but the airflow, combined with ample fans, made the evenings very comfortable. The condo is well stocked with towels, linens, and other essentials. I especially appreciated the washer/dryer. In summary, I was very happy with the condo, the location, the view from the lanai(s), the swimming pools, and lastly, with the interaction with Gayle before and during our stay. Thank Brian for the Fabulous Review. We Work very hard and Strive to make our home an Oasis In Paradise. Mahalo and We hope to have you stay with us again in the near future. My recent stay at this condo is a very pleasant experience. The condo is fully stocked for our convenience. The owner got everything in her kitchen including basic spices and ingredients for cooking our meals. She even has beach chairs and umbrella for us to use. Furnitures on decks are very comfortable and relaxing. This is truly a "home away from home" plus an amazing ocean view. It is located a little south of the heart of Kona and very near two beautiful beaches, one for snorkeling and one for boogie boarding. My boys enjoyed their new "gecko" friends that seemed to hang out on the balcony every day. My son even told the geckos that he will "facetime" them when he gets home. If you don't mind not having air conditioning, there were fans everywhere around the house, this place is awesome. Best of all, you cannot beat the price! Thank you Gayle for everything. THank you Phuong for an Amazing Review. We truly work very hard to make Our Home the Oasis in Paradise for our Guests. Spent a happy week here enjoying the condo and the area. Photos are very accurate. The kitchen has a very large assortment of pots, cooking equipment, and condiments left from previous tenants. The upstairs lani had a great view out to the ocean, and comfortable lounges. Bedroom very large and bed very cosy. Bath area a bit convoluted with doors etc, and we thought anybody with serious mobility issues may have trouble. However, they do not need to open and close all the doors as long as their partner is aware they are there. In house laundry is wonderful. The sunset view is great, and the darkening blinds to keep the sun out in the later afternoon can be arranges to allow more light in during the rest of the day by simply moving them around a bracket. Lots of books and tourist help available.